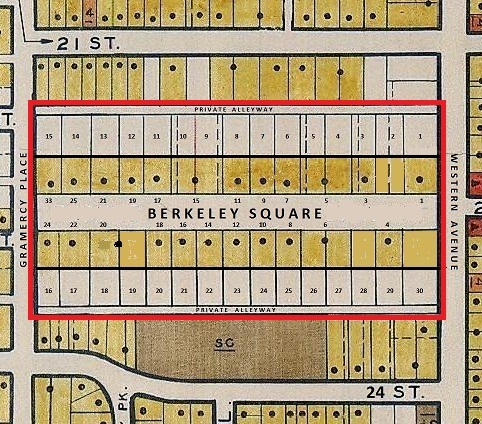 Berkeley Square's original design of 12 100-by-250-foot lots to a side became 15 to a side by the time the subdivision opened in 1905, with all but the four end lots measuring 80 by 250; those of the east end measured 110 by 250, while those at the Hermosa/Gramercy end were the uniform 250 feet in depth, though with widths varying, perhaps due to a slight variation in the street grid, from 92.56 feet at the north end of lot 15 to 92.92 feet at the south end of lot 16. Changes were made in the sizes of some house lots through combinations and at least one strip purchase; 20-foot service driveways ran along the rear of the lots on both the north and south sides. The service driveways, like the main street, were reserved for the private use of Berkeley Square householders. While it might seem logical to begin with #1 Berkeley Square as we get ready to begin our tour inside the gates, there was in fact no house with that address until about 15 years after the first one on the street was built...which was not #1, but rather #26. That is, until it became #6. It should be noted that the numbering of the houses of Berkeley Square was one of the mysteries I was able to solve only after some initial confusion shared not infrequently by Los Angeles newspapers even, in some cases, into the '20s. The first houses were given addresses based on lot numbers apparently assigned by the developer, Mr. Burke, who numbered north side lots 1 through 15, Lot 1 being at the Western Avenue (eastern) end. Lots 16 through 30 were on the south side, running from west to east. 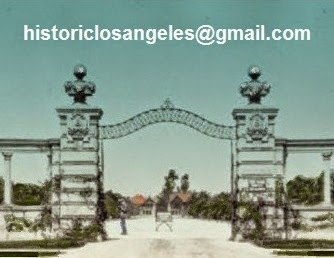 While the houses that became #1 and #5 actually came to occupy lots 1 and 5, around 1912 a change in addresses occurred, presumably to have the Square conform to the rest of Los Angeles, with evens on the east and south sides of streets, odds west and north. Later, too, there was some deviation in the new numbers, for no reason I can think of besides that perhaps the owners just liked the sound of "25" to "23," say, or "33" to "27." The later house numbering is shown on the WPA land-use map above along the central drive of the Square.